Martha's first book, TWIST, was published on July 14th 2016. You can purchase a copy on Amazon here or find a copy in all major bookshops. 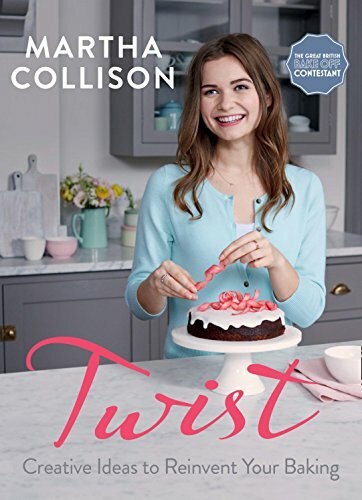 In Martha's first book Twist, she offers a brilliant new approach to baking – a way to master baking, while adding 'twists' to recipes to make contemporary bakes that everyone will love. With clever illustrations and know-how throughout, alongside beautiful photography, Martha demonstrates how to take basic recipes and alter them into something new. Whether it’s a cake, a biscuit or even a pastry recipe, she shows how to alter the method, the balance of ingredients or the mixture of flavours to ensure exciting, magical bakes every time. Transform her Never-Fail Vanilla Cupcakes into Lemon Cheesecake Cupcakes, for example, or Caramel Macchiatos. Try Pink Grapefruit Drizzle Cake, instead of the usual Lemon, and then mix it up with Gin & Tonic flavours. Or take Macarons to a whole new level and try Cosmopoliton or even Mojito versions.